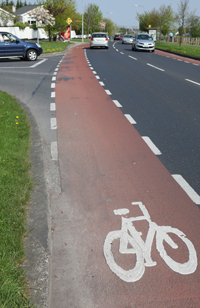 Side roads present either as T-junctions, left turns or right turns depending on the approach direction. 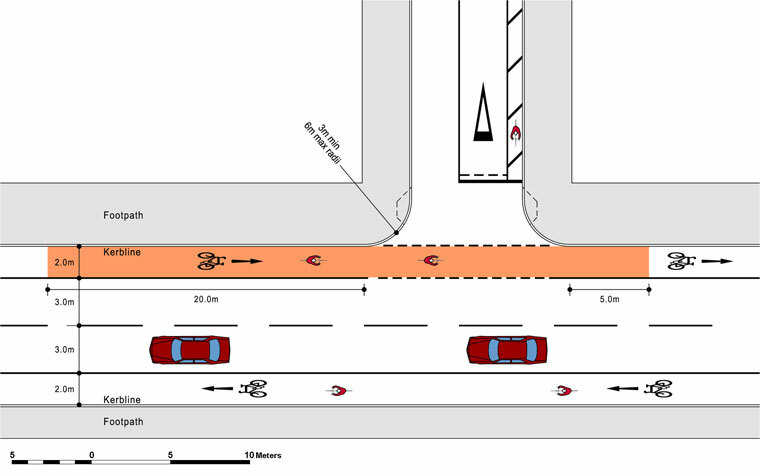 This section considers non-signalised junctions at side roads along main cycle routes. 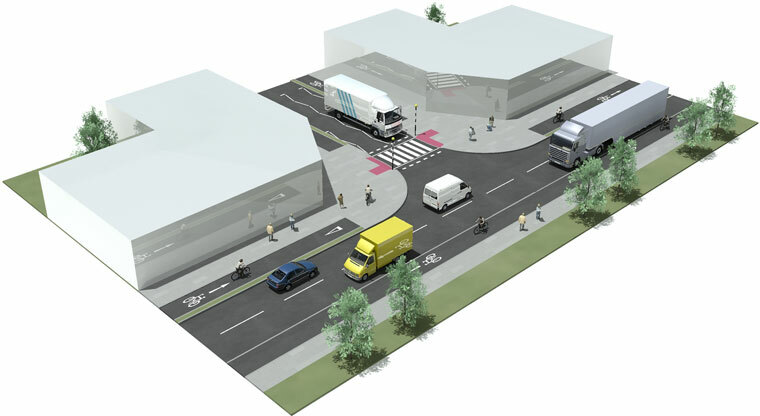 The objective is to control traffic movements and speed, and to ensure legibility for all road users. 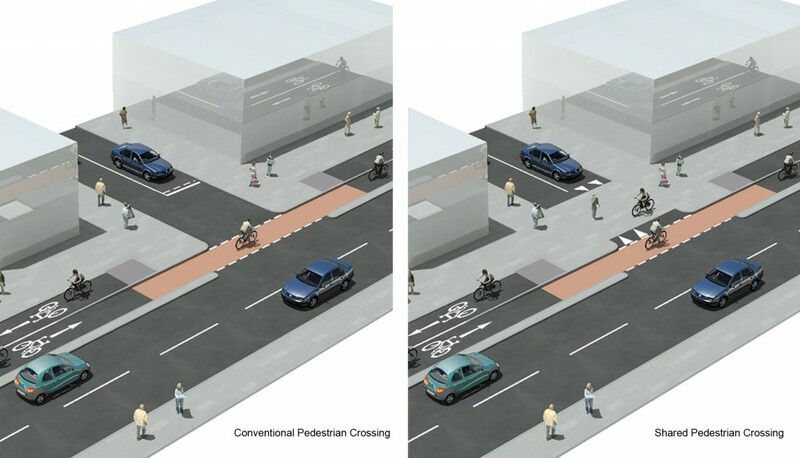 Key items to consider in making side roads more legible and cyclist-friendly are covered below. Side roads should use a single 3.0m wide lane approach. 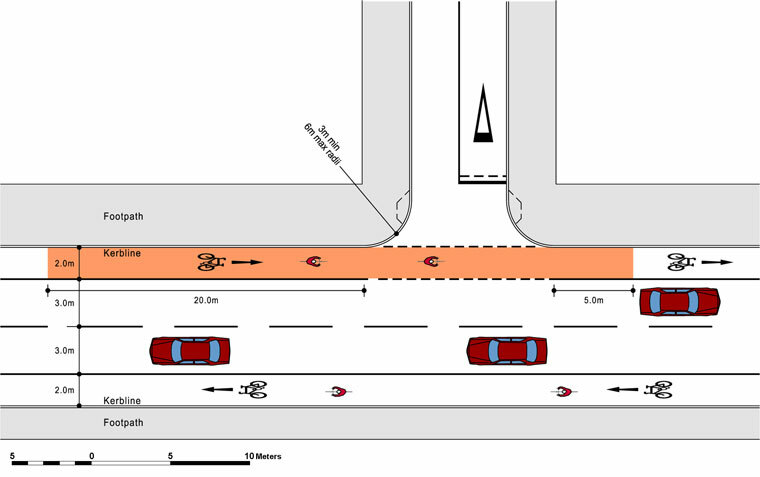 A single approach facilitates clearer visibility between motorists and cyclists on both roads. 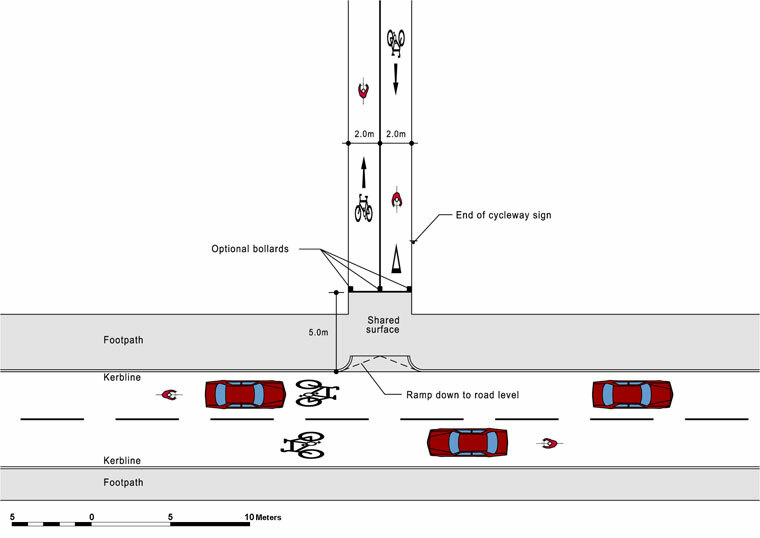 In contrast, double approach lanes obstruct visibility. 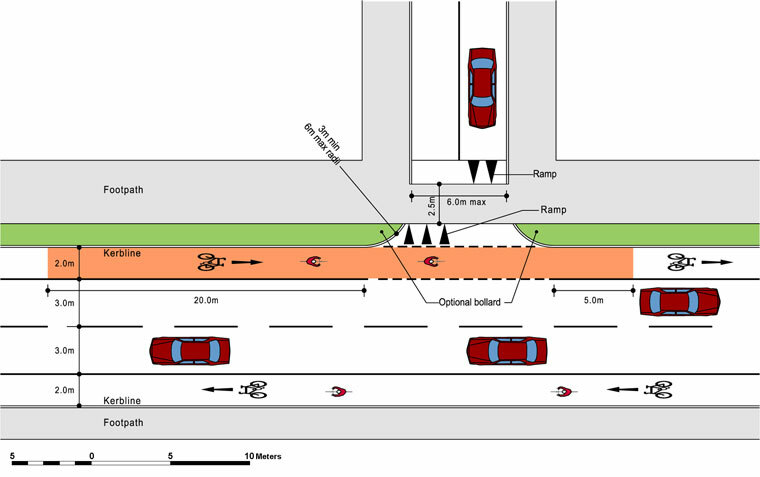 Emerging left-turning motorists may not see cyclists approaching along the main road due to vehicles in the outer lane of the side road. 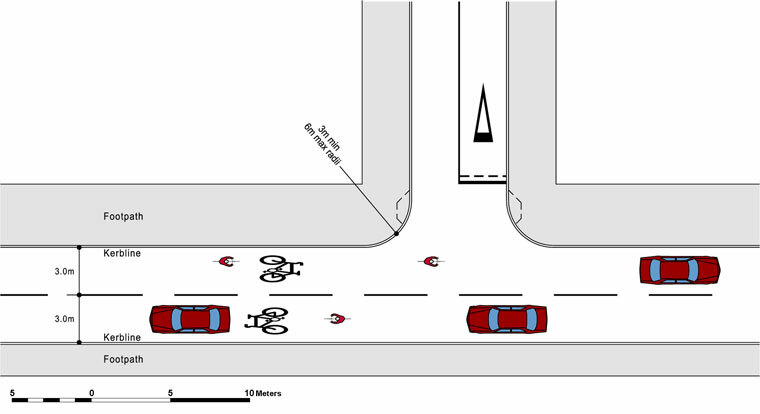 Furthermore, if there are two lanes, there is no obvious way for a cyclist to turn right from the side road onto the main road. 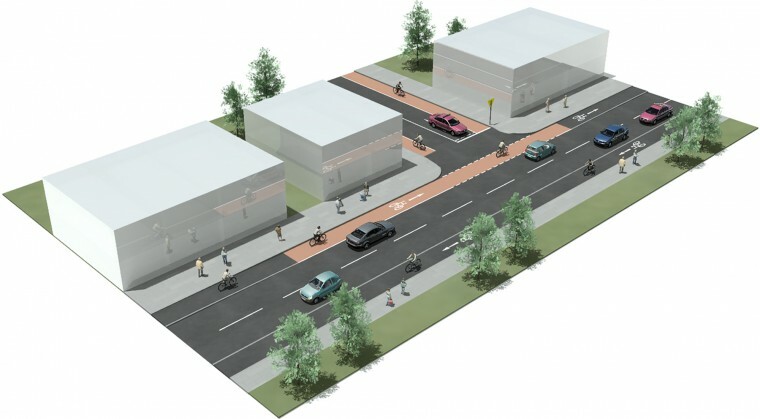 In built up areas, set back stop signs, yield signs and road markings should be located such that they are highly visible, to increase junction legibility, and reinforce the expectation of main road priority. 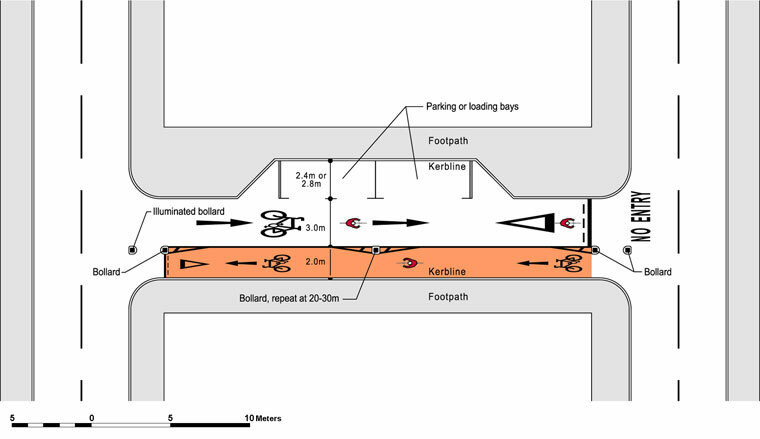 Stop and yield lines should be located at the first point of conflict with pedestrians, i.e., the back of the footpath, (or the building line or the fence line depending on context). 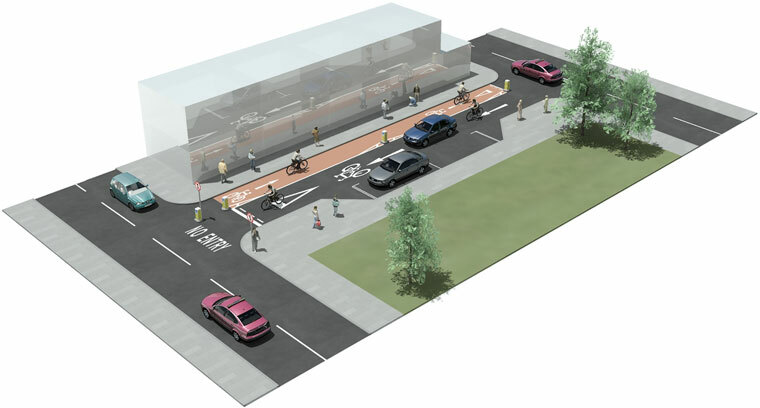 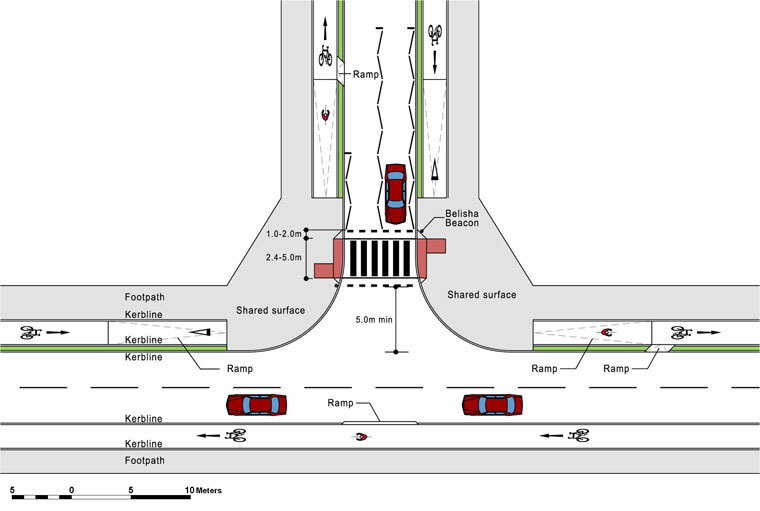 Under this design, emerging vehicles make a two stage approach to the junction. In the first stage, motorists stop or yield at the set back location, to allow pedestrians cross the side road with greater comfort and security. 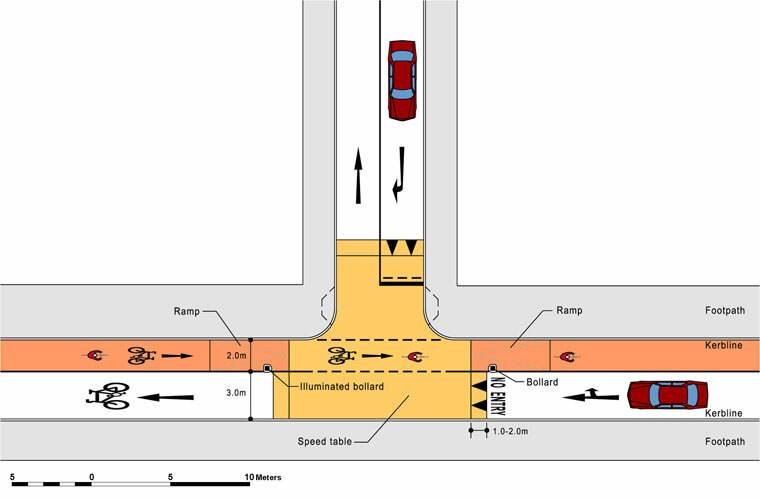 In the second stage, motorists proceed to the actual junction at a slow speed giving them time to see cyclists approaching the junction along the main road. 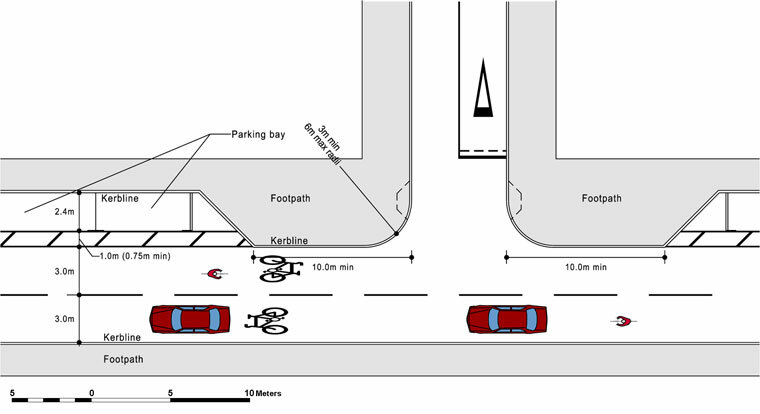 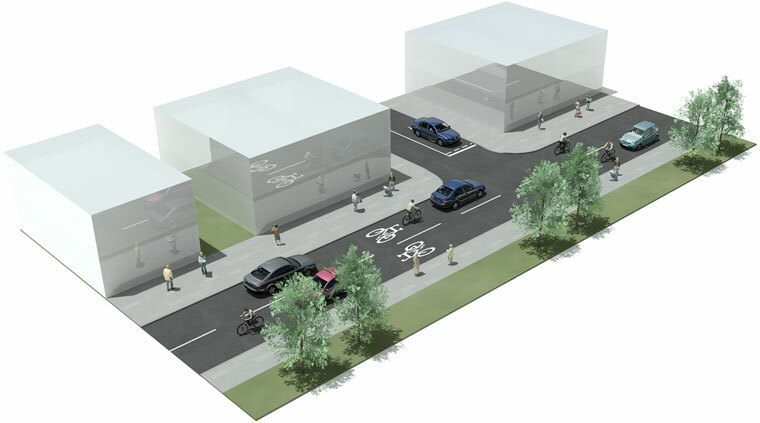 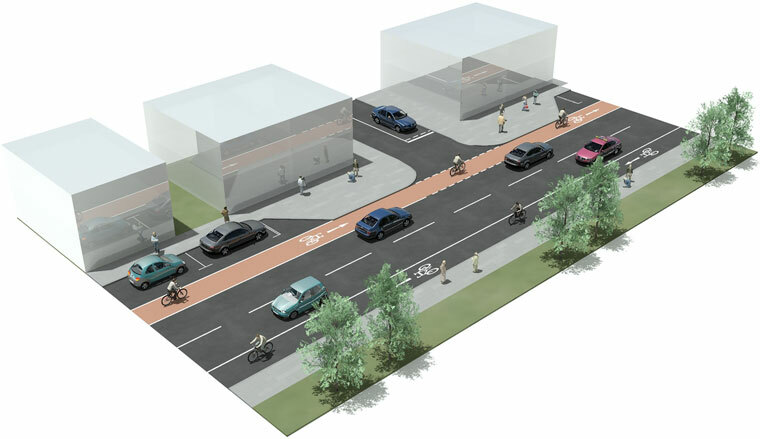 Where cyclists share the road space, either in a mixed street environment or with cycle lanes, a tight kerb radius of 1.0m to 3.0m at the mouth of side streets restricts the speed of turning vehicles. Where side roads have cycle tracks, it is important to ensure the cycle track radius is at least 5.0m to ensure cyclists do not swing out into the path of turning vehicular traffic. 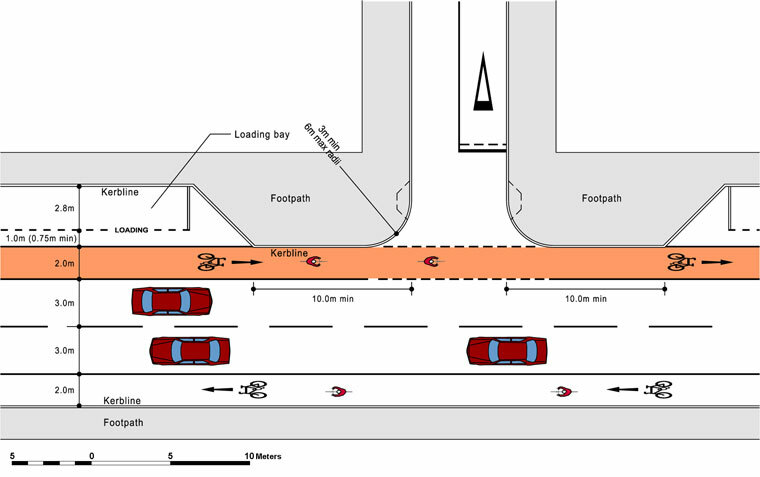 Where possible, a mandatory cycle lane on the side road should be provided to ensure cyclists have access to the stop line. 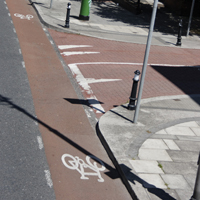 This confers an advantage on cyclists in situations where there may be periodic queues on side streets. 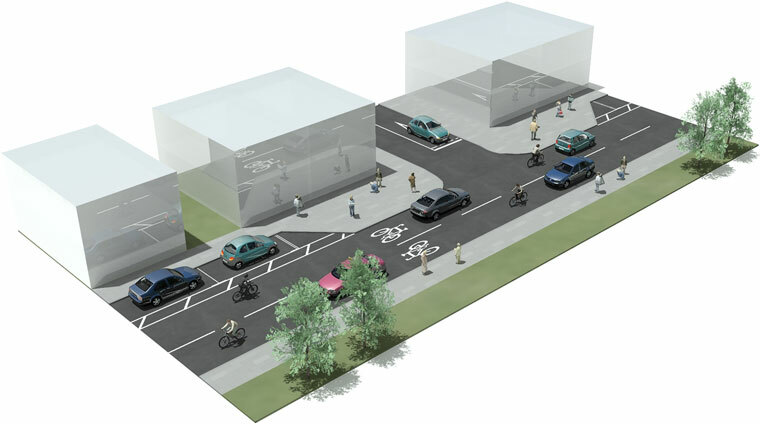 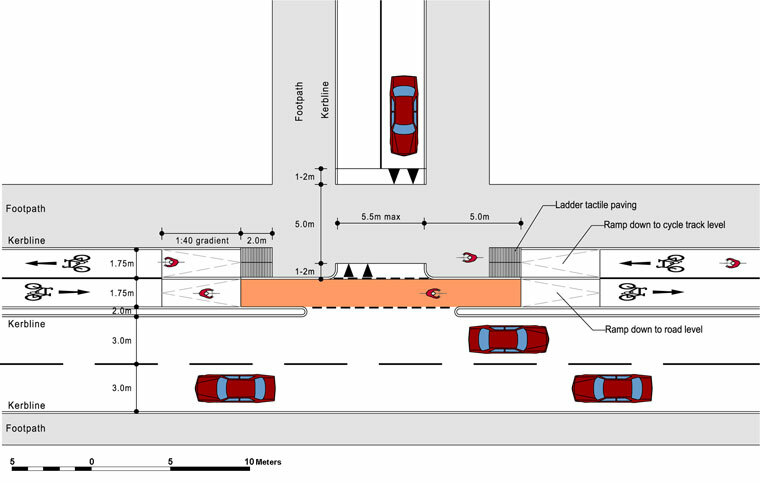 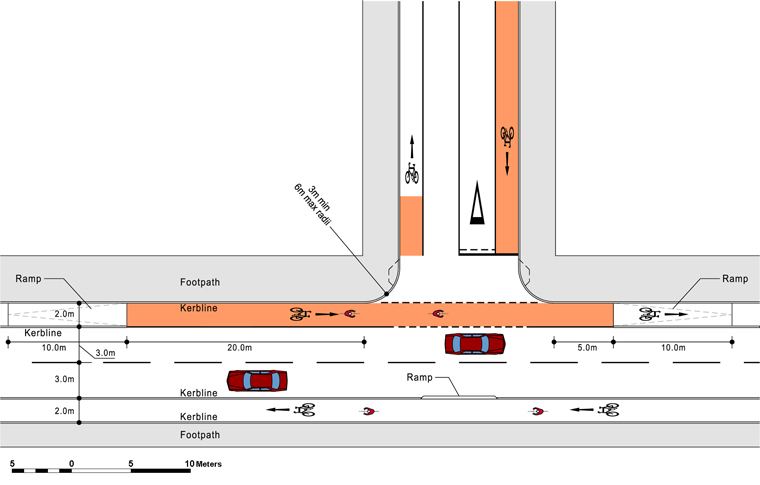 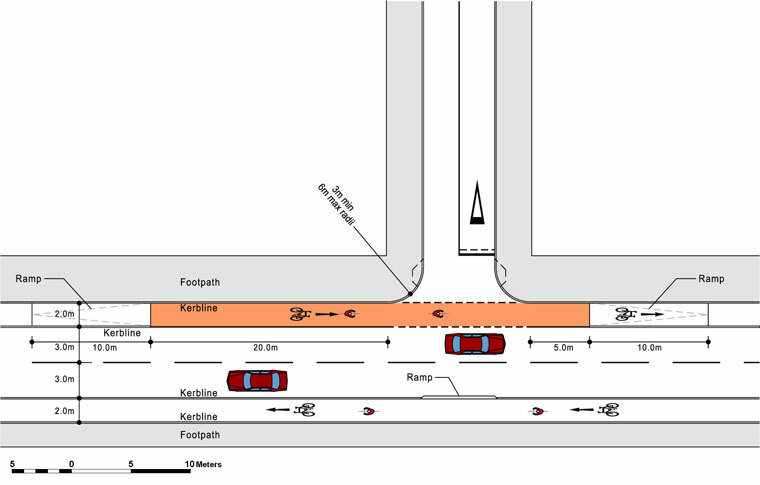 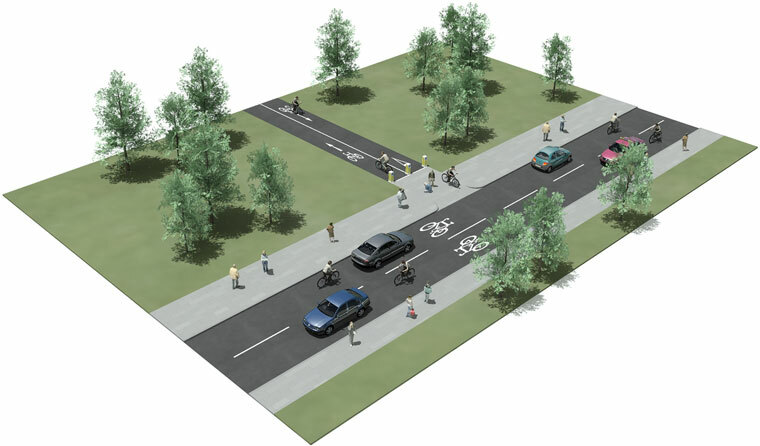 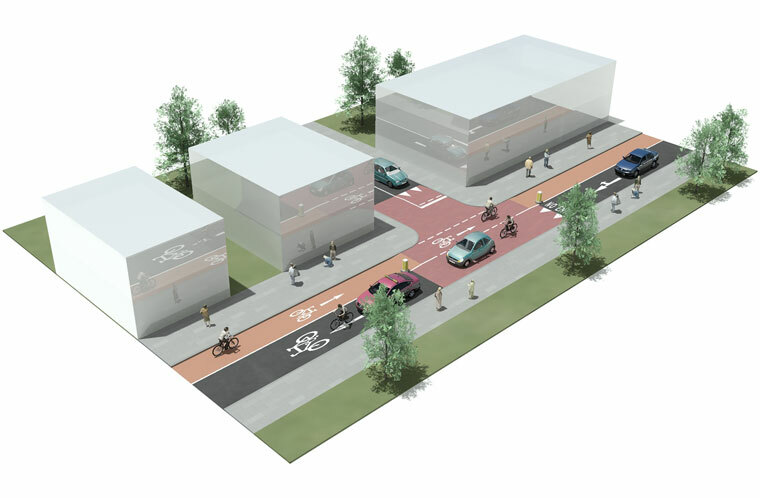 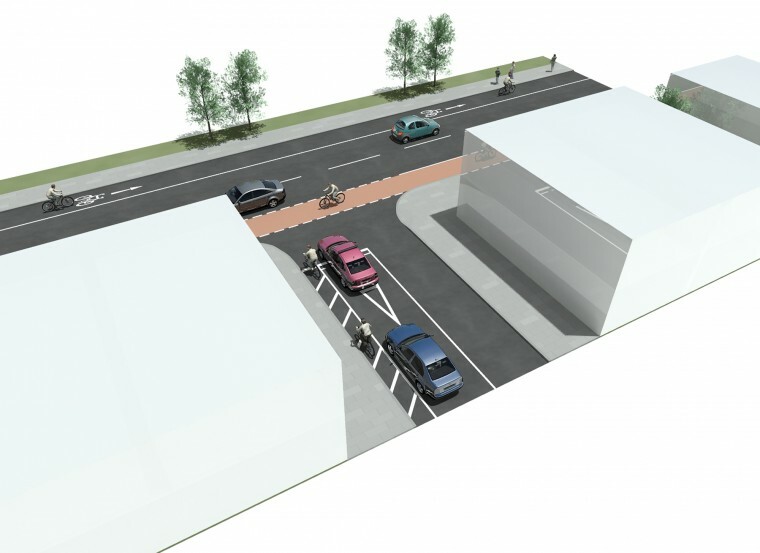 The following drawings illustrate how different main road traffic regimes interface with the unsignalised side road.